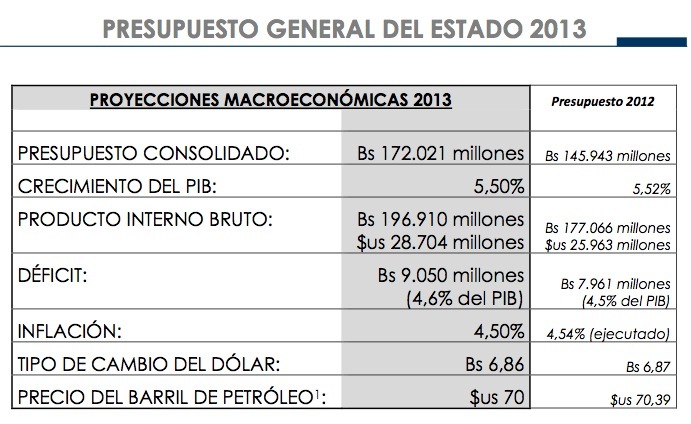 The General Budget of the State for year 2013, presents an increase on fiscal revenues, but expenses are also increased. At the Central Level, it is observed a deficit situation and the use of resources for the Sovereign Bonds (debt) to cover the expenses of the General Treasury of the Nation (TGN). It is adverted the bet of the Government over the extractive sectors and public companies; however, it is yet to be perceived the priority over the productive investment for the diversification of the economy and employment generation. – Revenues for hydrocarbons (IDH and royalties) projected a 38% increment, explained by an increase of production. – Current expenditures will be increased by 16% and public investment by 17%. – Almost a third part of the investment corresponds to State owned enterprises. In general, it is observed an important weight over public companies in the budget and in resources’ assignment. – With regard to the allocation of the investment by sectors, the one who gets the most is Transport (specially roads), with 30.2% of the total. 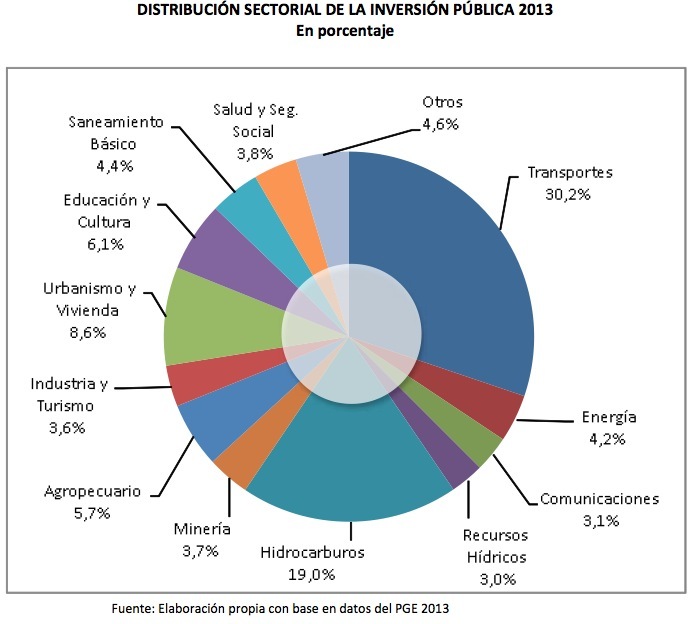 – The investment of the extractive sectors – like hydrocarbons and ores – is more than double when compared with productive investment related with diversification and employment generation, like the Agriculture, Industry and Tourism sectors, that altogether, just receive 9.3% of the total. Investment allocation on productive sectors reveals an “extractive” preference, more than an exchange of the productive matrix. – It is programmed a deficit (more expenses than revenues) of the General Treasury of the Nation (Central Level), a greater deficit of the overall public sector. – Again, it is planned to engage in external debt, around $500MM through the Sovereign Bonds, making a total of a billion dollars, considering the same mechanism, by end of last year. However, it can not be identified the expense budget with these resources. It appears, that were registered as expenses with TGN resources, like they were monies from taxes to be used by the Central Level in different current expenditures. 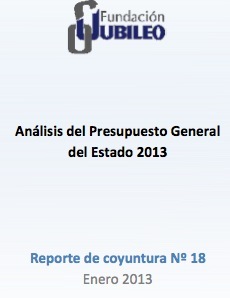 The original Spanish document can be found here: ANALISIS PRESUPUESTO 2013 – FUNDACION JUBILEO.